Chances are that if you have a Twitter and follow hockey, you've probably heard a rumor started by @HockeyyInsiderr, you just may or may not know. For some reason, many people continue to follow him and believe his idiotic rumors. 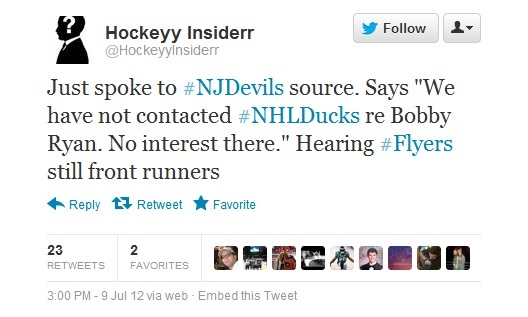 In fact, the mysterious character that "HockeyyInsiderr" is has amassed over 21,000 Twitter followers. Anyway, I usually ignore people like him. I've never followed him, and I never will. While I disagree with what he does, which is essentially trying to create rumors (like Brodeur for Semin two years ago and Parise for Malkin last summer) and inflate reports to boost his follower count, he doesn't force anyone to follow him. If people follow him, that's their problem. There was a little extra buzz surrounding him recently. Why? Well, usually when he's wrong about something, he's able to cover up and pretend that never happened. He was unable to do that this past week. On July 3rd, the night before Zach Parise and Ryan Suter signed with the Minnesota Wild, "HockeyyInsiderr" boldly tweeted that there was a 95% chance that Parise was heading to the Penguins and Suter had pretty much agreed to go to Detroit. He was the laughing stock of Twitter the following day. His sources must have misguided him. Eventually, he got into some kind of Twitter dispute with some members of the media, including TSN analyst Darren Dreger. The response was overwhelming. The general consensus was that the Pittsburgh Penguins get covered enough as it is, and not even "HockeyyInsiderr" himself would fall for this sort of outrageous trade rumor. So after eliminating Rick Nash, since he has a no-trade clause, my followers suggested a Bobby Ryan-to-New Jersey trade rumor. I decided to do a Ryan to New Jersey for Adam Henrique, a prospect and draft picks (everyone that helped me used a variation of that trade). 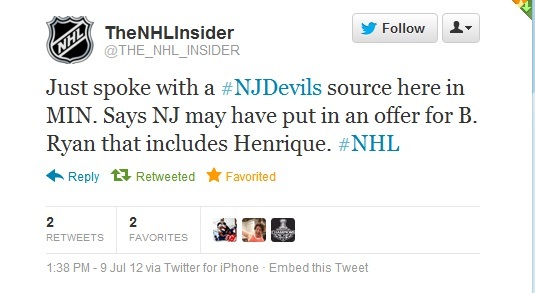 I then got some followers (mostly Devils fans) to help me out. @Tholen21, @ZlAbuZzz, @Hadly_, @HenriktoDaniel,@Scottyk9 and others joined me, and we each became a source. Each of us then e-mailed "HockeyyInsiderr" (whose e-mail address is conveniently on his Twitter page) as employees or friends of employees of the Ducks and Devils, and through the day on Sunday, we sent him an e-mail saying that we had heard of this trade rumor. So basically anyone that e-mails him can be one of his "unverified sources." The fallout was priceless. First of all, apparently, "HockeyyInsiderr" is the source to others, too. How's the weather in Minny?! 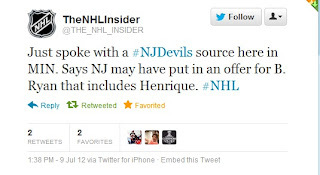 Some other blogs, including Devils blogs, began to report this and my mentions became full of Devils fans who were freaking out that Adam Henrique was going to get traded. Ugh. But he's wrong quite often, so to him, today was nothing new, but for us, I'll be honest, it was pretty comical to see him "report" that. I guess we shouldn't be surprised that he fell for such a scam. When you're so desperate for attention and determined to be the first to report everything, I guess you'll fall for anything. As it turns out, getting scammed wasn't the only notable thing that happened to Mr. Insiderr yesterday. He had a meltdown on Twitter last night, as he pretended to have obtained Roberto Luongo's cell number and then tweeted photoshopped images of TSN's Darren Dreger. But personally, nothing was more satisfying than the scam. Thank you for visiting Down Goes Avery. My goal is to share the world of hockey to you, through my weird and twisted eyes. Please do me two brief favors, and follow me on Twitter (@DownGoesAvery) and "like" my Facebook page. For my new car blog, see here: Traction Control Off. This site's newest feature, DGA's Devils Daily, is a brief summary of the day's Devils news (and sometimes other significant hockey happenings), as well as an opinionated take of everything going on in the Devils' world. That can be a positive review on a game, a take on something in the news or a rant about something that annoys me. DGA's Devils Daily can be found under "pages" or you can click here. Also, to see the GIF of the week, click here. Which NHL team are you a fan of? Sometimes, you don't always want your head in the game. Should Stefan Matteau stay with the Devils? Which current Devils goalie prospect has the most NHL potential? What will Zach Parise's future with the Devils be? Who should the NJ Devils draft with the 4th overall pick? 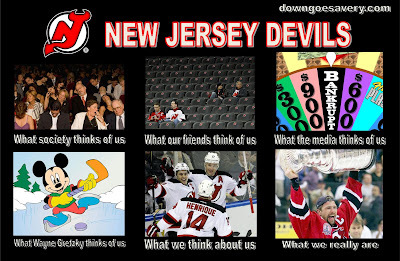 Who should be the next head coach of the NJ Devils? How far do you honestly believe the Devils should go this season? Who should be the next captain of the NJ Devils? Should the Devils retire Scott Niedermayer's #27? How should the Devils find Martin Brodeur's successor? In the end, Down Goes Avery. Please don't steal stuff from me. Simple theme. Powered by Blogger.